The city of Tuscania’s Etruscan origins can be seen its it numerous necropoli. 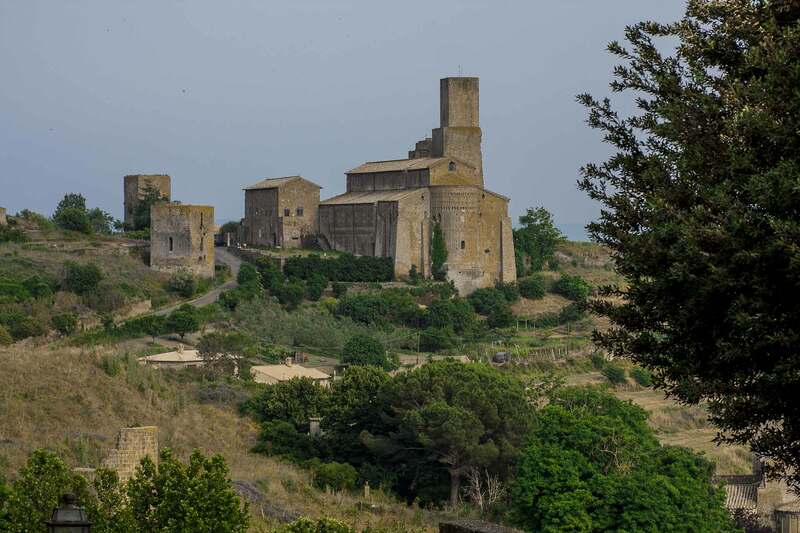 Tuscania began between the 8th and the 7th century BC but the most important period was between the 4th and the 1st century BC. The acropolis of the Etruscan city was on the hill where today the Cathedral of St. Peter (S. Pietro) and the bishop’s palace are located. The ancient town probably coincided with the actual town. There are numerous necropoli outside the medieval center’s walls at Pian della Mola, Peschiera, Calcarello, Madonna dell’Olivo and Sasso Pinzuto. After a Roman period and the fall of the empire, Tuscania remained small but during the Longobard period, the church of Santa Maria Maggiore was built. Around 778 with the donation of Charlemagne, Tuscania entered the Patrimony of St. Peter in Tuscia. In the 9th century the Cathedral of S.Pietro was built. In the following centuries, all of the Tuscia area was involved in a period of conflict between the Papacy and the Empire and the beginning of the Comunes.